During the last years of the Nineteenth century, Thomas Dowling made a fortune in the lumber and railroad businesses in Suwannee County. Born in Hamilton County in 1851, he grew up poor due to his father’s bad health. However he was an enterprising and intelligent young man that did not let obstacles stand in his way. Marrying Laura Weeks in 1876, Thomas Dowling worked as a wheelwright until 1880, when he had saved up enough money to enter the sawmill business. First operating a lumber mill in Lake City, he moved his operations to Suwannee County in 1888. There, he constructed a large lumber mill and planning mill on the east side of Live Oak. The lumber mill was located on Railroad Street near where Suwannee Pack was later located and among other associated businesses had a cooper’s shop (hence the names of Mill Street and Cooper Street for two of the roads in that area today). The commissary for the lumber mill was located on Howard Street near where City Hall is now located. 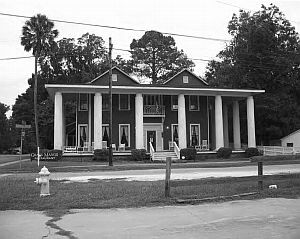 In the last years of the nineteenth century, Dowling built a large home in the Greek Revival style on Duval Street that still stands today; at the time, the wealthiest citizens of Live Oak lived along Duval Street between Walker Avenue and Mussey Avenue. According to one of the local stories, Dowling’s mansion originally had porches on both the first and second story. However, after visiting the family of one of his daughter’s courters, he changed the style to the more imposing Greek Revival one seen today with massive columns around the front and side. After a number of owners, Dowling’s once-beautiful, but neglected mansion was renovated in the late 1900s and early 2000s by a local preservation group composed entirely of volunteers to serve additional uses. It has recently reopened as the Dowling House Restaurant. Dowling also built large houses for his daughters that stand today. In 1905 Dowling also helped to establish the Dowling Lumber and Naval Stores Company with locations in Live Oak (where his relative Robert L. Dowling’s sawmill had stood and where the Live Oak, Perry and Gulf Railroad machine shops would later reside off Second Street and Houston Street) and Dowling Park. The new company had a capital of $2 million. In 1907, the company’s name was changed to Dowling Lumber Company; at the time, it had a daily capacity of 250,000 feet of lumber. Dowling also established several other lumber companies around the state. 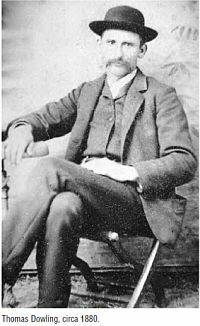 In an attempt to increase his fortune during the heyday of railroads in the area, Thomas Dowling helped form the Live Oak, Luraville, and Deadman’s Bay Railroad Company. A lack of cash meant that the railroad could not be completed, but it was soon bought out and renamed the “Live Oak and Gulf Railway Company” (not to be confused with the later Live Oak, Perry and Gulf Railroad) and finished by the new owners. The Live Oak and Gulf Railway, along with the Suwannee and San Pedro Railroad, then merged with the Florida Railway in 1905. Not content to sit on their laurels, the Dowling family constructed the R. L. Dowling Shortline Railroad for their Live Oak sawmills in the 1890s. The gradual elimination of marketable timberlands around the county seat forced the Dowlings to extend their railroads toward the Suwannee River to a community called Hudson on the Suwannee (also called Hudson upon the Suwannee). In 1906, this Shortline was incorporated as the Live Oak, Perry and Gulf Railroad (popularly known as the “Loping Gopher”) to serve the Dowling family’s sawmill and later freight and passenger traffic; its headquarters and machine shops were in Live Oak. To honor the family responsible for the overnight growth of the community of Hudson on the Suwannee was renamed Dowling Park. Dowling’s sawmill in Dowling Park was one of the two largest sawmills in Florida at the time (the other was also located within Suwannee County). The largest sawmills and dozens of homes for mill workers were located within the confines of what is now the Advent Christian Village. Thomas Dowling also began Live Oak’s first waterworks in 1897, paid for solely from his own resources (and coincidentally built across the street from his new mansion on Duval Street). Three years after the construction of Dowling’s waterworks, it is recorded that only eight families had bathroom facilities. However, its use increased, especially after 1907 when the city of Live Oak purchased it. Dowling was probably the first person in Florida, and certainly in Live Oak, known to have owned an automobile. On the first day he drove his new Steamer through the streets of Live Oak, he caused such a stir that Sam McGinness, a janitor in the Suwannee Democrat building, thought that the devil had come to get him, fell to his knees in the street, and prayed. In 1911, Thomas Dowling’s minister, Burr Bixler, persuaded him to donate a large tract of land on the Suwannee River where he could establish an Advent Christian campground. This campground was short-lived, but after Bixler was contacted about finding a home for a dying widow’s children, he proposed an Advent Christian orphanage on the site instead. Begun on Dec. 17, 1913, as an orphanage and a home for “old and worn out ministers and missionaries,” the Advent Christian Village was Florida’s first retirement center. Gradually increasing in size and scope of services, though slowed by the Great Depression, it has remained a viable employer for nearby citizens. Today the Advent Christian Village continues to operate and expand, serving the needs of its retires as well as encouraging further growth and services in the area. Among his other civic achievements, Dowling helped to construct the Advent Christian Church in Live Oak in 1900 that was located near the intersection of Duval Street and Ohio Avenue. When it burned down in 1904, he graciously donated funds for its replacement. When Robert L. Dowling’s wooden structure holding the Suwannee Democrat burned down around 1906, Thomas Dowling constructed a brick structure to replace it. Despite his many private endeavors, Dowling only served once in public office, when he was a Live Oak city councilman from June 1896 to May 1901. In failing health, Thomas Dowling sold most of his timberland and lumber and railroad interests to Richard W. Sears (of Sears and Roebuck) in 1910. Thomas Dowling died on June 13, 1911, and is buried in the Live Oak Cemetery along with many Dowling relatives. Note: This article originally appeared in the Suwannee Democrat 10-25-2013. The Suwannee County FLGenWeb Project, Inc.has been given consent by Eric Musgrove to re-print the article on our website. Mr. Musgrove is a seventh generation Suwannee County resident and historian. He can be reached at ericm@suwgov.org or 386-362-0564. His bio appears here.